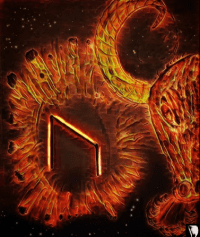 Uruz is the 2nd rune in the elder futhark, which is the oldest of the runic alphabets. It consists of 24 letters divided into 3 aetts. It is 8 runes in each aett. The 1.st aett is called Freys aett. Uruz upright ~ masculine power, ferocity, vitality, wild nature, courage, great strength, manifestations, healing and recovery from health problems, rise in status, dominance, growth, virility, shaping ones reality, wild weather (weather the storm), responsibility, turning weakness into strength, letting something through a ‘gate’, that once released can not be retained, good health. Uruz reversed ~ Destructive forces, weakness, apathy, confusion, fatigue. This is the birthstone for people born between between 14th of July to 29th of July(starting and ending 12.30 pm), and the message of this rune is closely related to your life purpose. It is the inner rune(your inner self) for people born between 13.30-14.30. It is believed that Uruz originally represented the masculine side of a primordial pair, the feminine being the cow Audhumla (see Fehu). Another God associated with this rune is Thor, the most macho of the Vikings gods, a champion and the god of stormy weather. It is easier letting the wild animal loose than to get the wild animal back in again. So whatever you are starting when Uruz turns up in a reading, you neither can walk away from nor contain once is has started. There’s no returning now. Whatever you have let lose has it’s own power and is like a force of nature. Uruz represents the most powerful force of all, the power of love, which is endlessly good. If you have been unwell or have had lack of energy, then Uruz is here to remind you to connect to God(love) for energy. You are a part of it, and denying this truth will tap your energies. God is truth, God is love and the more you align yourself with this the more powerful you will become, the stronger the force will run through your veins and the more God can trust you with the responsibility to help others, our planet included. You are powerful when you live your life truthfully. If you are off track and Uruz is showing up in a reading you will quickly be guided back on your path. Being off your path can be a very painful experience with little of no flow and joy. Uruz is a very powerful rune to meditate on if you need to find you way. Meditating on Kenaz with Uruz would be even more powerful, as Kenaz will light the way for you so you easily can see you path home (to living your truth). Water ~ Unexpected visitors, often from overseas. Fire ~ Trust in your intuition. Psychic abilities are strong right now. Earth ~ Look before you leap, take care of the details. Air ~ You have wind behind your sail and will make great advances.